Vous êtes ici : Accueil»Mobile Learning»Teach on Mars Lands on the planet Fosway! The red-and-white rocket blasts into the 2019 Fosway 9-Grid™ for Learning Systems as a Potential Performer! Come meet Teach on Mars on Stand #C28 at Learning Technologies (LT) London on February 13 and 14 to find out more. It’s been a busy start to 2019 for the crew of your favourite intergalactic learning tech spacecraft – and it’s about to get a whole lot busier as Teach on Mars celebrates yet more great news. Being selected for the first time for inclusion in the Fosway 9-Grid™ is a significant step forward for Teach on Mars in its continuing international development. With over 20 years of providing independent analyst input on HR-related strategy to multi-national enterprise clients, Fosway has become a benchmark source of impartial market insight. Its 9-Grid™ is considered an essential reference for any organisation looking to invest in learning technology – and it now features Teach on Mars, alongside other key strategic players in the European and worldwide Edtech marketplace! 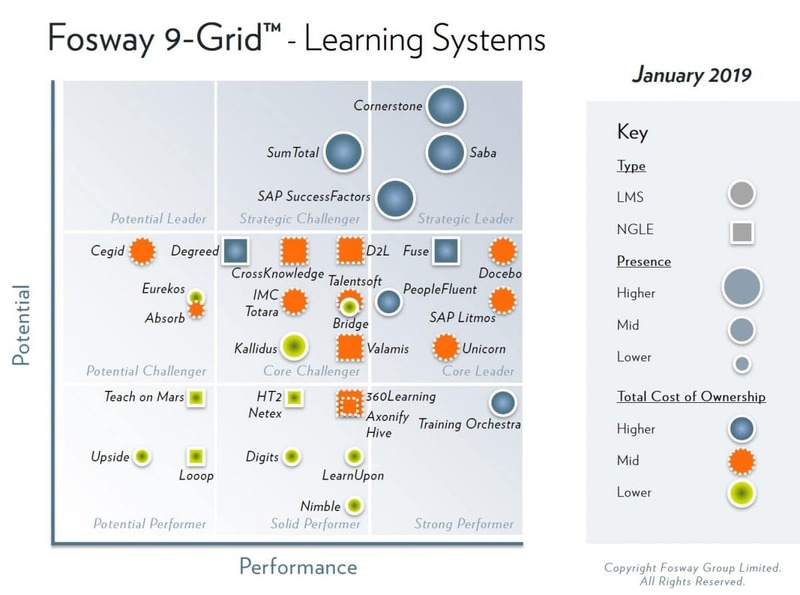 You can download a copy of the Fosway 9-Grid™ here. The company will have plenty of great stories to share with visitors to its stand (#C28), following a flood of key happenings over recent months. Most notably, on January 24, the mobile learning pace-setters announced the completion of a third round of funding, worth €7 million, to speed up their commercial expansion most notably in international markets; to extend and reinforce their content partner network; and to accelerate their R&D programme and investment in new smart algorithm development. And if you want to hear more about the Teach on Mars vision for next-gen connected learning, the company will again be hosting one of its popular use case seminars at LT London. This year, it is delighted to be showcasing unique contributions from marquee client Lisa Heidemanns, who is Chief Client Officer at Rimowa (a German premium luggage manufacturer owned by the LVMH Group with over 100 boutiques globally). Lisa will be sharing her insights on Rimowa’s recent experience of launching a brand new mobile learning initiative to a learner population spread right across the planet. She will be joined on-stage by Teach on Mars International Marketing Director Adam Charlesworth, and the pair will use the Rimowa story to offer food for thought on the challenging question of mobile content strategy. Scheduled to take place on February 13 at 2:00pm, in Theatre 4, the seminar will also feature Teach on Mars strategic partners and draw on the experiences of other blue-chip clients who have taken their learning mobile.